LOGAN, Utah – Frank Maile will remain on the Utah State football staff as the assistant head coach and tight ends coach, it was announced Tuesday by newly appointed head coach Gary Andersen. With Maile coaching tight ends moving forward, the defensive line will be coached by Andersen. Maile, a 2007 Utah State graduate, has spent the past three seasons as the Aggies’ co-defensive coordinator and defensive line coach. Overall, Maile has spent eight years on the Aggies’ staff, as he was a defensive graduate assistant from 2009-10 and the defensive line coach from 2011-13. Maile helped Utah State to one of its most successful seasons in school history in 2018 as the Aggies went 11-2 and tied the school record for wins (11) and home wins (6), while being nationally ranked for six-straight weeks for the first time in school history. USU also set a school record by winning 10 straight games in 2018 and tied for first place in the Mountain Division of the Mountain West with a 7-1 mark. With Maile serving as the interim head coach, Utah State won its fifth bowl game in school history this season with a 52-13 victory against North Texas in the New Mexico Bowl. For USU, it was its seventh bowl game in the last eight seasons and 13th overall, including its fifth with Maile on staff. During the 2018 season, Maile helped coach an Aggie defense that currently leads the nation in turnovers forced (32), interceptions (22) and three-and-outs forced per game (5.58), while ranking third nationally with six defensive touchdowns. USU also ranked 35th nationally in scoring defense this season (22.2 points allowed per game). As Utah State’s co-defensive coordinator and defensive line coach in 2018, Maile mentored three Aggies who earned honorable mention all-Mountain West honors in senior defensive end Adewale Adeoye, junior defensive end Fua Leilua and junior nose guard Christopher ‘Unga. Adeoye and Leilua led all USU defensive linemen and tied for ninth on the team with 38 tackles, while ‘Unga had 31 stops. Adeoye added 1.0 sacks and 4.0 tackles for loss on the year and led the team with three fumble recoveries to tie for fifth in the nation. Leilua had 1.5 sacks and 5.5 tackles for loss, and ‘Unga recorded 0.5 sacks and 2.5 tackles for loss this past season. As Utah State’s co-defensive coordinator/defensive line coach in 2017, USU allowed just 182.5 passing yards per game to rank 19th nationally. Furthermore, USU was sixth in the nation with 29 forced turnovers, including tying for second nationally with its 16 forced fumbles, and ranked fourth in the nation with five defensive touchdowns. During the 2016 season, Utah State allowed just 176.5 passing yards per game to rank 10th nationally. USU also ranked 47th in the nation in total defense (379.8 yards per game). In 2016, Maile coached a pair of Aggies to all-conference honors in Travis Seefeldt (second team) and Ricky Ali’ifua (honorable mention), who signed a free agent contract with the Kansas City Chiefs. Prior to his return to Utah State, Maile spent two seasons as the defensive line coach at Vanderbilt. In 2015, the Commodores’ defense ranked among the top-35 nationally in nine categories, including 28th in total defense (350.5 yards per game), 22nd in scoring defense (21.0 points per game) and 33rd in rushing defense (143.2 yards per game). As Utah State’s defensive line coach from 2011-13, Maile coached five Aggies to all-conference honors in Levi Koskan (second team), Al Lapuaho (first team), B.J. Larsen (second team), Jordan Nielsen (second team) and AJ Pataiali’i (second team). During his three years as defensive line coach, USU posted a 28-13 record and played in three-straight bowl games, winning the 2012 Famous Idaho Potato Bowl and the 2013 San Diego County Credit Union Poinsettia Bowl, and a 2012 Western Athletic Conference title. During the 2013 season, Maile helped the Aggie defense rank first in the Mountain West and seventh in the nation in scoring, allowing 17.1 points per game, the second-fewest allowed by the Aggies since 1971. USU also ranked first in the MW and eighth in the nation in rushing defense (106.7 yards per game), its fewest allowed since 1968, and first in the MW and 12th in the nation in total defense (330.9 yards per game). Utah State’s 2013 defense also ranked sixth in the nation in the red zone, allowing opponents to score 68.9 percent of the time, including just 19 touchdowns, to rank second nationally. Furthermore, USU’s defense ranked seventh in the nation in forcing three-and-outs with 5.6 per game, while its 7.6 tackles per loss per game ranked 10th nationally. USU’s defense also ranked 11th nationally in third-down conversions at 32.6 percent. Utah State’s defense finished the 2013 season holding five of its final seven opponents to 14 or fewer points. USU capped its season with a 21-14 win against No. 24 Northern Illinois in the San Diego County Credit Union Poinsettia Bowl as the Aggies held NIU’s high-powered offense in check and limited Heisman Trophy candidate Jordan Lynch to just 39 rushing yards. Utah State was also the only team in the nation not to allow a touchdown run of 10 or more yards in 2013, and allowed just two 100-yard rushers, while limiting its opponents to just 13 points following 16 turnovers. 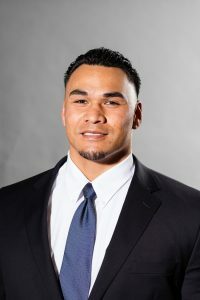 During the 2012 season, Maile helped Utah State’s defense rank among the top-15 in the nation in five categories, including being ranked first in the WAC and seventh in the nation in scoring defense (15.38 points per game), second in the WAC and sixth nationally in sacks (3.23 per game), second in the WAC and 13th in the country in rushing defense (113.77 yards per game), first in the WAC and 15th in the nation in total defense (322.08 yards per game), and first in the WAC and 32nd in the nation in passing defense (208.31 yards per game). In 2011, Maile helped Utah State lead the WAC in total defense (366.2 yards per game), as well as ranking second in the league in both rushing defense (127.7 yards per game) and tackles for loss (5.9 per game). The Aggies also were second in the WAC in opponent third-down conversions at 35.4 percent. Maile was a standout defensive lineman for the Aggies from 2004-07, making 21 starts in 42 career games. He posted 71 total tackles with 19.0 tackles for loss and one fumble recovery. In his senior season of 2007 as team captain, Maile accounted for 8.0 tackles for loss, tying for second on the team. A native of West Valley City, Utah, Maile was a first-team all-state defensive lineman at Alta High School in Sandy, Utah. He served an LDS Church Mission to the Dominican Republic from 2001-03. Maile earned his bachelor’s degree in interdisciplinary studies from Utah State in 2007 and earned his master’s in education in 2010. Maile and his wife, Heather, have three sons, Maximus, Samson and Titan, and a daughter, Cecilia. Utah State – New Mexico, 2018; NOVA Home Loans Arizona, 2017; Poinsettia Bowl, 2013; Famous Idaho Potato Bowl, 2012; Famous Idaho Potato Bowl, 2011.